FITCHBURG -- While lying in bed last February, David Tall decided he was going to take a "shotgun approach" to celebrating Alpha Rho's 50 years of business, distributing donations to organizations in the communities that helped the manufacturing company survive and thrive during its half century. David Tall, owner of Alpho Rho in Fitchburg, sits next to some of the thank-you notes he received after donating to area organizations. His company turned 50 in 2016 and Tall decided to give out a $100 donations to 50 organizations. Since the manufacturer of rigid-plastic boxes celebrated its 50th anniversary in February 2016, Tall, whose father Alvan founded the company, has donated $100 to various organizations in Fitchburg and Leominster in each of the last 50 weeks. 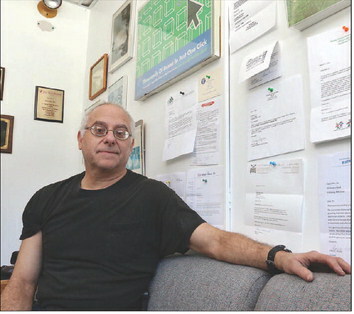 "What I wanted to be was to be as helpful to as many people as we could," said Tall, who has been working full-time at Alpha Rho since 1983. "I wanted to give something back. I didn't want to give just one lump sum. I wanted it to be impactful for many places." Tall said he donated money to places such as the Cleghorn Neighborhood Center, Stratton Players, Beacon of Hope, the Fitchburg Public Library, Fitchburg Friends of Felines, the Leominster Historical Society and other organizations in the Twin Cities. "Your contribution plays a vital part in helping us fulfill our mission to help reduce the numbers and the suffering of the stray cat population in the city," wrote Kathy Goguen, treasurer of Fitchburg Friends of Felines, in a thank-you letter to Alpha Rho. "Your generous donation will help us continue our work conserving local history," David Wilson, trustee of the Leominster Historical Society, wrote in a thank-you letter. "Your letter was a very sound public relations offer and you can be certain that if and when we need plastic boxes, Alpha Rho will be the first agency we contact." Alpha Rho started when Alvan Tall was working in the personnel department at Foster Grant. After founding a small injection-molding company, his managers at Foster Grant told Alvan Hill he either needed to fully turn his attention back to Foster Grant or leave. Alvan Hill was soon working in his parent's basement in Leominster to jump start the manufacturing company, opening in 1966. The company then moved to a Fitchburg location before settling into its current home, a 36,000 square-foot facility on Stevens Road. But even over the time period from his parent's basement to a facility that is used for production, warehousing and post-production space, the family business has always had a sense of community duty and pride, according to David Tall. "My father always had a sensitivity to giving back to the community and buying local," he said.